Color, pattern, texture. Whatever your preferences and room design needs, we've got an upholstery fabric that works for you. Come into the store to see and touch the hundreds of fabric options in person before you make your final decision on your custom sofa or chair covering. Durable and stain-resistant Elements QC Performance Fabrics also available. Create a guest room in minutes right in your living room with a sofa fitted with a sleeper mattress. A sleeper mattress allows you to convert your sofa to a bed for your friends or family members to use when staying overnight in your home while saving space when you don’t need it. Invite guests to sleep in your home instead of making other arrangements allowing you to make family holidays or reunions with friends more fun. 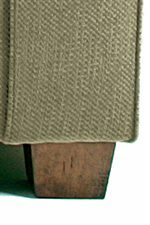 These durable frames are made from triple-doweled hardwoods, glued, screwed, and corner-blocked to extend the life of your upholstered furniture. This brand was tested to have a softer, plusher seat feel than even the big name brands. High density polyurethane foam is wrapped in high-loft polyester fiber, creating a soft but durable cushion. These cushions will provide you with years of that brand-new feel. 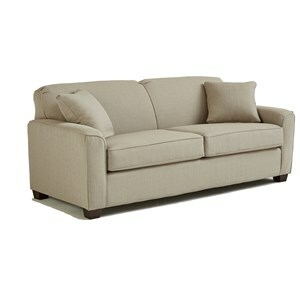 Clean and crisp, this sofa sleeper offers contemporary style and versatile function. Fit with a pull-out bedframe and mattress tucked neatly under boxed edge cushions, this item offers comfort and convenience both day and night. Great for hosting overnight guests or simply furnishing studio apartments, you can't go wrong with this multi-functional sofa. Available in twin, full and queen sizes. The Dinah Twin Sleeper Chair and Half with Air Dream Mattress by Best Home Furnishings at VanDrie Home Furnishings in the Cadillac, Traverse City, Big Rapids, Houghton Lake and Northern Michigan area. Product availability may vary. Contact us for the most current availability on this product. Pull-Out Mattress An Extra-Thick Mattress with Air-Over-Coil Technology. Inflates in 25-35 Seconds with Handheld Pump. The three bears would be pleased to find this great set. For the apartment dwellers or the small home owners, the two sofas feature a full and queen sleeper while the chair-and-a-half sports a twin sleeper. 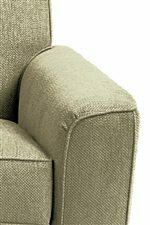 The tightly upholstered back is divided by a center cord and each back has a slight backward tilt for a more stylish appearance. These sleeper sofas are designed to save space and save dollars. The Dinah collection is a great option if you are looking for Contemporary furniture in the Cadillac, Traverse City, Big Rapids, Houghton Lake and Northern Michigan area. 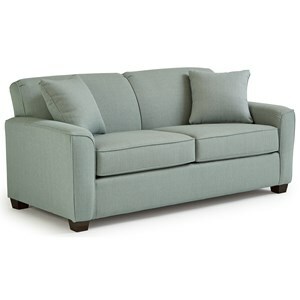 Browse other items in the Dinah collection from VanDrie Home Furnishings in the Cadillac, Traverse City, Big Rapids, Houghton Lake and Northern Michigan area.